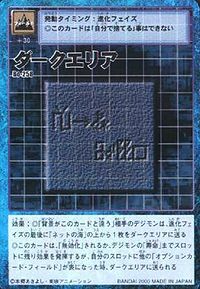 The Dark Area (ダークエリア, Dāku Eria), also known as Hell (地獄, Jigoku) and the Underworld (冥界, Meikai), is a jet-black, abyssal "graveyard of deleted data" that is governed by Plutomon and located within a spatial distortion of the Digital World, below the Net Ocean. 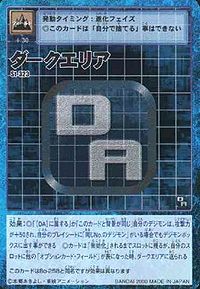 How it came to be within the Digital World is a mystery whose secrets are known to be held by Grand Dracumon. 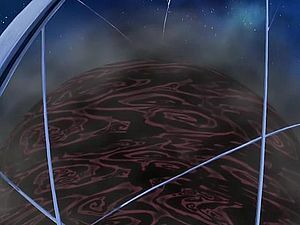 It is also serves as the place to which Digimon are ultimately transmitted when their life span finishes or they are defeated in battle, and is guarded and supervised by Anubimon, who constantly surveys the arriving data; if their data is good, it will reset them back to a Digitama, but if they are evil, it imprisons them within the eternal darkness. This page was last modified on 20 April 2019, at 06:56.